The following is a transcription of a recent assembly of one of the foremost Thunder Sub fan organizations, and is presented to the readers of Let's Anime as a public service in the hopes that this will further understanding of both Thunder Sub and the fans thereof. Hello! Welcome to the biannual meeting of the Real Deal Thunder Sub Club. As you know, it's official - we are now the largest Thunder Sub fan organization in this part of the state! Captain Noah himself would be proud of your dedication. Now I'd like to bring our new members up to full cruising speed, so to speak. 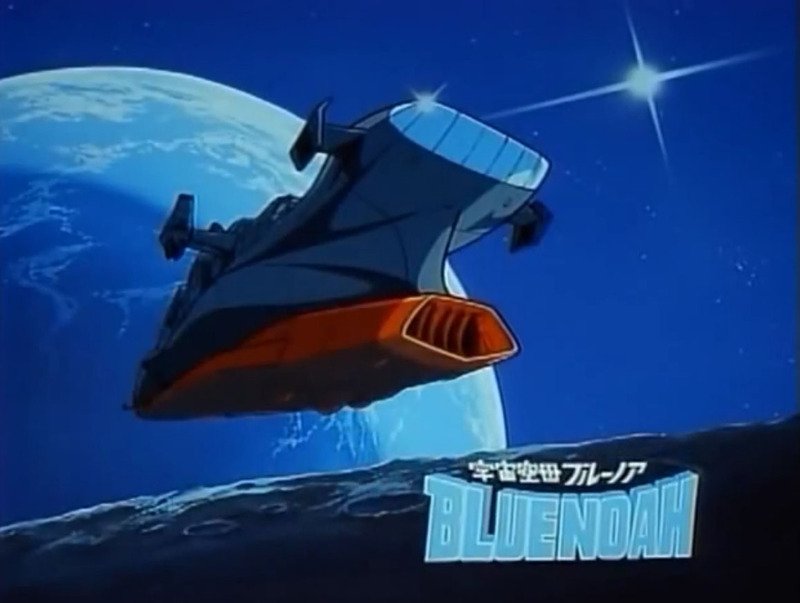 Thunder Sub – that's TWO WORDS, ladies and gentlemen – began as the Japanese animated TV series Space Carrier Blue Noah, back in 1979. 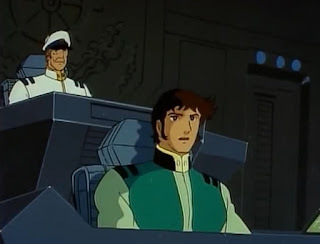 In the midst of activity regarding another of his many animated productions involving outer space battleships, producer Yoshinobu Nishizaki somehow managed to find the time to inspire a handpicked team and start an entirely different voyage. This wouldn't be Nishizaki's first undersea trip; as producer of the animated version of Tezuka's Triton Of The Sea, he'd learned a thing or two about getting wet. Springboarding from the sub-sea fantasy of second generation SF writer Hikari Tanaka, writers Hideaki Yamamoto (The Super Girl), playwright Seiji "La Seine No Hoshi" Matsuoka and future Pretty Cure scribe Takashi Yamada created an entirely new saga of a super-ship, mankind's last hope against an invading alien armada. With direction by Tomoharu Katsumata (My Youth In Arcadia) and veteran animation director Kenzo Koizumi – fresh from work on Grandizer, Mazinger Z vs Black General, and Daikengo – the Blue Noah was ready for launch. It is the year 2052! When the far-away planet Gotham faced destruction via black hole, dictator Leader Zytel (or "Doctor Z" in English) ordered the construction of a gigantic colony vessel – the charmingly named "Terror Star" - to allow their civilization to escape. Using its gravity beams to decelerate from interstellar speeds, the Terror Star's insertion into Earth orbit wreaks havoc on our planet, and the Death Force air attacks just make things worse. Fleeing earthquakes, tidal waves, and Death Force fighters, our hero young Shin Kusaka (Collins) follows the dying wishes of his scientist father and travels to the secret science base N1. 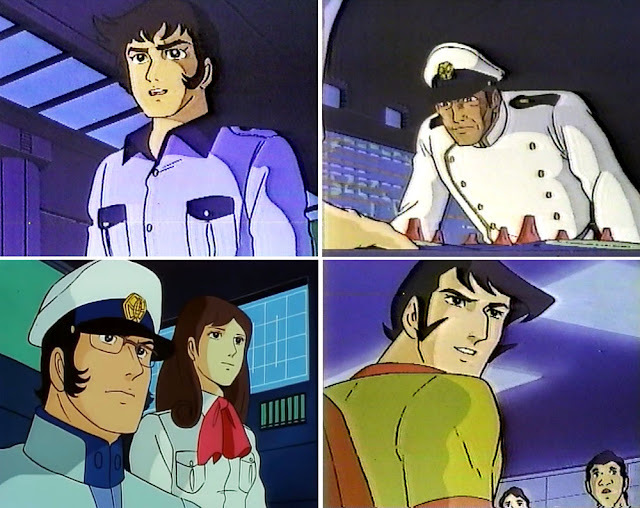 Collins and his academy classmates find themselves on board the planet Earth's last hope, the super submarine Blue Noah (or as we know it, Thunder Sub), much to the surprise of the sub's skipper Captain Domon (Noah). Launched from a secret base, manned by an untried crew of recruits, equipped with an array of powerful weapons including the unstoppable, bow-mounted "Anti Proton Gun", the Blue Noah sets out on a journey through Earth's oceans, travelling from secret research facility to secret research facility, to find the device that will allow them to defeat the Death Force and their Terror Star! Space Carrier Blue Noah would air on NTV and TBS stations in Japan from October '79 until March of 1980, premiering with a special telefilm pilot. Largely ignored by Japanese audiences, it would vanish after 24 weeks. Ancillary merchandise would include model kits, soundtrack LPs, tie-in manga, a sweet "DX" toy and an Asahi Sonorama single; a mere trickle of merchandise compared to other, more popular shows that might have involved space battleships. But hey, we here at the Real Deal Thunder Sub Club will take whatever we can get! Regardless of public indifference, select fans like ourselves were enthralled as all 27 episodes (the pilot was cut three ways for syndication) intrigued us with the deadly rivalry between Colonel Lupus and the Thunder Sub and revealed the secret relationship between Captain Noah and default love interest Anna. We thrilled to the guerilla war waged across a ruined Earth and we shuddered to learn of Gotham's plan to install gravity converters at the poles and make Earth uninhabitable for us humans. Without worldwide syndication, the show would merely be an even more obscure footnote. Fortunately, a global thirst for cartoon programming would bring Thunder Sub to us. In the mid 1980s Nishizaki's Office Academy cut a syndication deal for Blue Noah with Western-World Television, noted for their David Warner-Carrie Fisher Frankenstein telefilm and co-producing the British nuclear-war gloom-drama Threads. 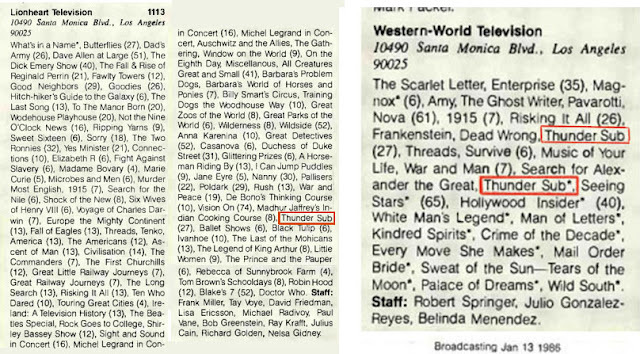 If you caught the BBC's classic Dr. Who on American public television at the time, you might recognize Thunder Sub's distributor – Lionheart Television, of which Western-World owned a good chunk. Thunder Sub's TV broadcast credits don't list a dub cast, but sharp-eared viewers familiar with the TNT's 1990s airing of tokusatsu classic Ultra Seven might recognize the same voice actors in Thunder Sub, leading us to conclude Blue Noah's localization was executed by the same outfit – Montreal based Cinar. 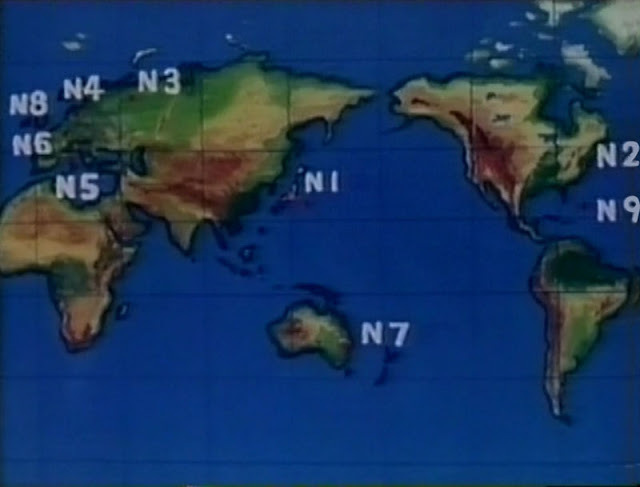 Thunder Sub's competent English cast handled the show's complex science-fictional concepts magnificently, with only a few missteps along the way (identifying Japan as "Hawaii" on a world map shows somebody wasn't doing their geography homework). Thunder Sub would air in a few US markets, including Atlanta's WATL 36. A compilation of the first 3 episodes would also get a UK home video release. Thunder Sub was also shown in Italy, Spain, Sweden, Russia, and the Arabic nations, but after a few seasons the show would sadly vanish, leaving nothing but traces in industry publications and snippets saved to off-air VHS tape. Still, the fact that our Real Deal Thunder Sub Club exists proves the show meant something special to at least a few of us – those of us who gasped at the Death Force's heavy water plants destroying Earth's ecosystem, who thrilled as the evil Colonel Lupus's space fighters engaged the Thunder Sub in a sequence animated by the great Yoshinori Kanada, who clutched the arms of our living room sofas and nearly upset our Capri-Suns and our Fruit Roll-Ups as the Terror Star lurched out of control straight for Earth, with only the Thunder Sub standing in its way. Now, as members of the Real Deal Thunder Sub Club, we're fully aware of the haters who say Blue Noah is merely an imitation of another Yoshinobu Nishizaki-produced cartoon, Space Battleship Yamato. They claim the characters are Yamato retreads, the weapons and story arcs are similar, that even the music is close enough to Yamato's soundtrack to make the most casual viewer say "Wait a minute!" and "Oh, come on!" and "Holy jeez, what a rip off!" We here at the Real Deal Thunder Sub Club have heard it all. 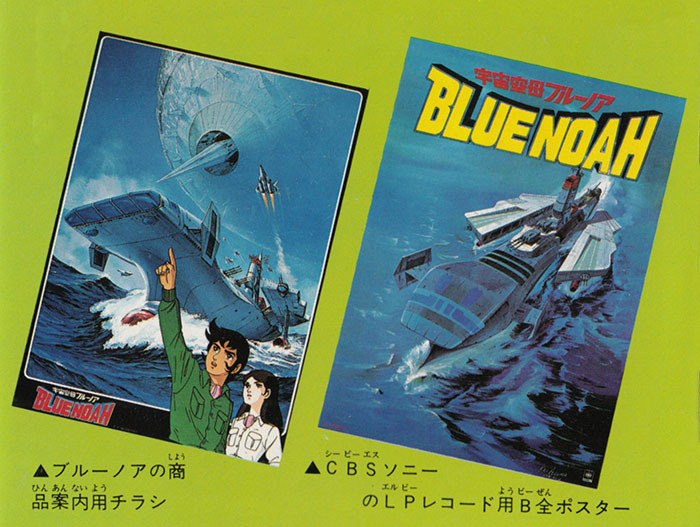 And our reply is a polite no sir, we beg to differ; Blue Noah is NOT a rip off – Blue Noah is a blatant Yamato cash-in, an undersea exploitation vehicle steaming through a victory lap for Nishizaki, as he grabs whatever market share was left lying on the table, filling a timeslot left blank after Yamato 2 ended, keeping the advertisers happy and his Office Academy office gainfully employed. We here at the Real Deal Thunder Sub Club think of Thunder Sub and Space Battleship Yamato as two great shows that happen to share a few elements. That is our position, and if you don't like it, there's the door. Just kidding! That door is locked. Even the angriest Yamato fans have to acknowledge vast differences between the two shows. Thunder Sub doesn't feature a kooky male ship's doctor – Thunder Sub's doctor is a woman! There isn't a cat on board the ship – there's a dog! And sure, both shows have young female leads whose main job is to look worried, but Thunder Sub dismisses entirely the Space Battleship Yamato concept of ethereal space goddesses. No cosmic mystery forces in Thunder Sub! 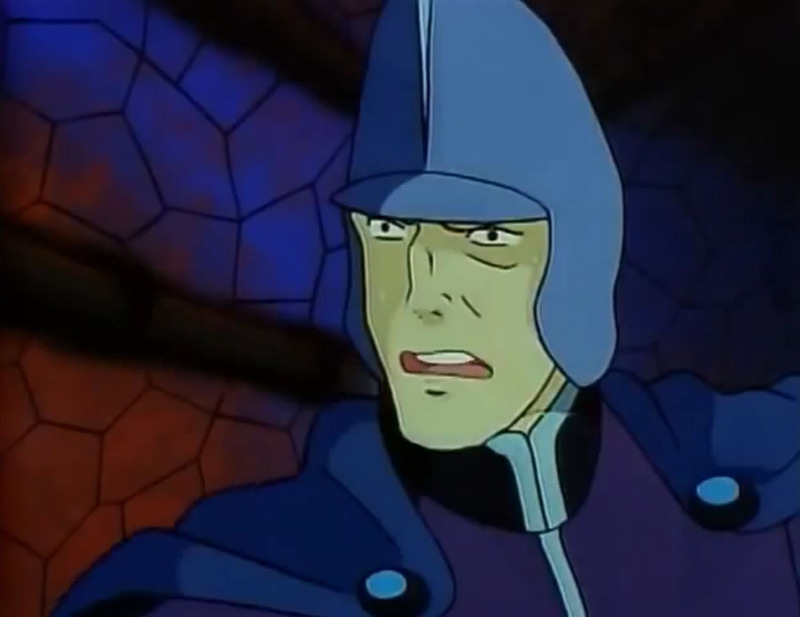 Even the evil leader of the Death Force over there on the Terror Star, well, he's not a retread of Yamato's Leader Desslar. No, Thunder Sub's enemy commander is a real doctor, with a PhD in taking over planets, building Terror Stars, and blasting his entire culture across light years to conquer the Earth and secretly repopulate it with his own specially-bred master race of Doctor Z clones! And let me tell you when the Death Force rank and file find out, they aren't happy about it! In fact, the climax of Thunder Sub takes a sharp turn away from typical Space Battleship Yamato planet-exploding heroic sacrifice cliche just at the last minute! Not to spoil things for those of you in club who haven't yet achieved Full Real Deal Thunder Sub Real Dealness, but it turns out planet Earth is saved by the Death Force itself! That's a twist Yamato would never allow itself to take, and one more in the "win" column for Thunder Sub! But let's be fair. Frequently the animation is wonky in that very 1980 sub-contracted, barely moving, get-it-done-already way. And the kind of outer-space romanticism that Space Battleship Yamato did so well, the melancholy cosmic queens marooned on dead planets, universal love saving the galaxy, that sort of thing, well, that sort of thing is completely absent. Thunder Sub is much more invested in dressing its characters in sensible dungarees and making sure the audience knows how sonar can reflect off of differing temperature layers or clouds of plankton. If you've ever wondered what Yamato would have been like if Nishizaki hadn't joined forces with Leiji Matsumoto, Thunder Sub is the answer; gadget-heavy space checklists of moving from point N1 to point N2 to point N3 with faces set in grim determination, while the music swells in a just-this-side-of-actionable way. And ultimately I think that's what led to Blue Noah / Thunder Sub's 'blink-and-you'll-miss-it' performance on the world's TV screens. Viewers had been there and done that. As impressive as a flying submarine with an Anti-Proton Gun is, it can't match a romantic universe filled with space goddesses in diaphanous robes. Even though we here at the Real Deal Thunder Sub Club are as Real Deal as any Thunder Sub fans can be, we still have to face facts bravely, just as Captain Noah and Collins would do if they were here, and if they were real. But take heart; the world has not abandoned Thunder Sub. Fans around the globe keep the show alive with fan sites, releases of its various national iterations on DVD, and by making their carefully hoarded off-air tapings available for all on YouTube. 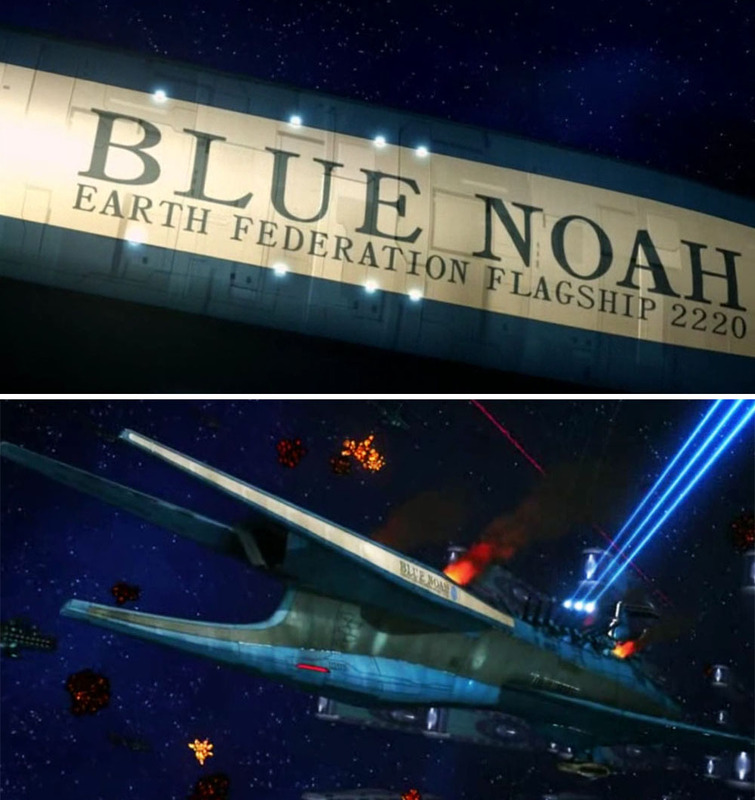 Even Yoshinobu Nishizaki himself didn't forget his orphaned space submarine, prominently naming an Earth flagship "Blue Noah" in his 2009 feature Space Battleship Yamato Resurrection. The Real Deal Thunder Sub Club is a select group of Thunder Sub fans. Membership is strictly limited to those who publicly demonstrate True Thunder Sub Real Dealness through a variety of methods. In fact, you may already be a member and not even know it. 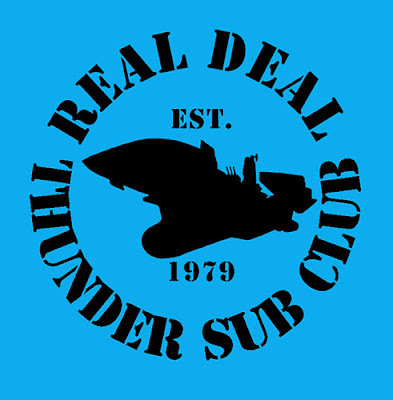 Do not attempt to contact the Real Deal Thunder Sub Club; they will find you.